Jaffe: "Your WipeOut is our Twisted Metal." While it's always done great business in the US, OTT PlayStation car combat franchise Twisted Metal has never quite replicated that success on European shores. So, why the disparity? According to creator David Jaffe, it's all down to cultural identity. "My layman's sociological view of Europe is that you guys tend to respond to things that are sleeker, cleaner, more refined, a bit more humorous," he told Eurogamer backstage at E3 today. "I think Twisted Metal is rough around the edges, it's raw, it's like a garage band. It's dented, it's busted up, it's oil and diesel fuel. And to us in America, at least to Twisted Metal fans, it wears that as a badge of honour. We like that spirit. "In the same way Wipeout was never a mega hit over here and has always been appreciated by a smaller group than in Europe. There's a similar dynamic going on. Your Wipeout is our Twisted Metal." Jaffe also blamed heavy censorship of the series' last outing, Twisted Metal Black, in a number of European countries for reducing its impact on this side of the Atlantic. "Our last really big Twisted Metal went out everywhere except America with all the storytelling, cut scenes, characters and things that gave it a conceptual definition ripped out for censorship reasons." Finally, he argued that both the developer and publisher haven't done a good enough job of properly explaining what the game is all about. "If you just look at the game on face value you either respond to the spirit and the imagination or you don't. What you don't see is the depth in the game. You don't see the fighting game and the sporting spirit. "I think especially in Europe the candy wrapper is so off-putting to certain people. You say 'that's not for us, there's not enough irony, there's not enough humour'. It's not given the chance to unveil what's beneath the candy wrapper." Jaffe added that he was hopeful gamers in Europe will give it a fairer crack of the whip when it launches on PlayStation 3 later this year, but he hasn't been tempted to sand off its edges to appeal to a wider audience. "In terms of reaching out through the internet, reaching out through Twitter, in terms of having SCEE being much more excited about the game, yeah, of course we're hopeful," he explained. "What we're not going to do is go 'how do we cut the balls off this spirit, of this essence, just in order to say maybe we'll get more fans. There are games that can survive that kind of neutering, but Twisted Metal isn't one of them. If you don't get it, you don't get it. "I hope Europeans give us a shot. I know we'll do better with this one than we have ever done before, but I'm not going to beg." Among the unconverted? Our recent hands-on preview should help you decide whether Jaffe's creation is up your street. 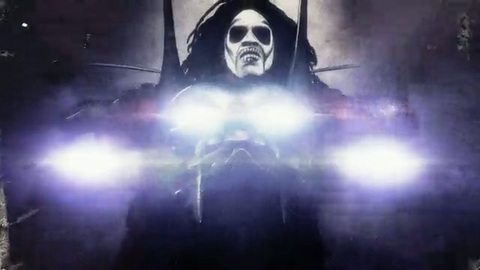 Jaffe: This "will be the last Twisted Metal game made." "I hate free-to-play but I love aspects of it." David Jaffe to quiz Sony today.